Are your photographs not turning out the way you intended? Do you want to improve your photography skills so you can create better images? If you own a Digital SLR (DSLR) or a Mirrorless Interchangeable Lens Camera (MILC), this book was written for you! Kevin Gourley, professional photographer, instructor, and author, leads you through the 30 most important things you need to know to effectively use your camera to achieve consistently better photographs. Through Kevin’s years of experience leading photography workshops, he has encountered many questions, challenges, and mistakes photographers often make. This book will help you avoid these common mistakes, become more skilled in operating your camera, and create the images you desire. Readers are saying: "highly recommend" "many useful tips" "easy to read, learn and apply" "an excellent book for anyone wanting to improve" "very well written" "explains camera terms in a way that you understand" "a wonderful guide" "a great resource" "this book should always be in your camera bag"
1. For beginners, you can learn the important basics. For advanced photographers, you can get cutting edge information and/or reinforce what you have already known. 2. I have read this book twice since I bought it. I have learned many useful tips from Kevin's book along with how to use my camera. I really like how Kevin shows us how to utilize the modes (for what purposes) of our camera, both Canon and Nikon. 3. Each tip is followed by a couple assignments which help readers improve photography skills from the hands on experience. 4. With 30 great tips and photos in just 143 pages, Kevin is able to explain and illustrate not only how but also why; he also makes these tips easy to read, learn, and apply. ***** Take Better Photographs Now! 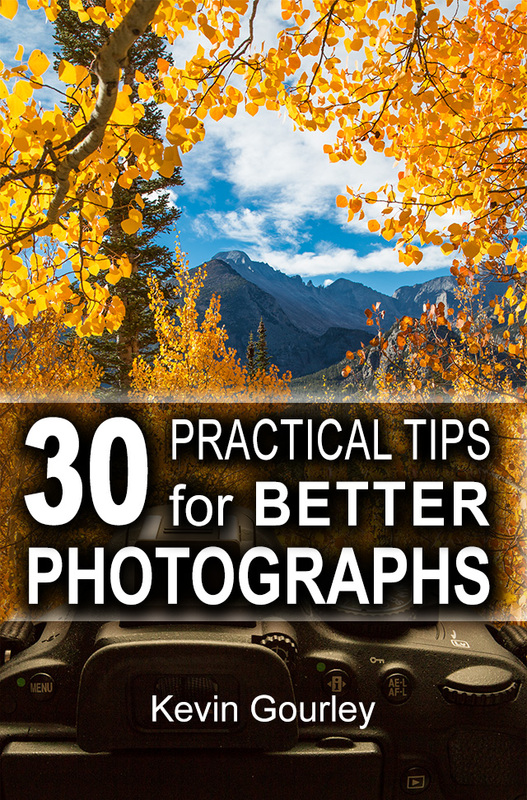 30 Practical Tips for Better Photographs is exactly what the title describes - It is an excellent book for anyone wanting to improve their photography. Very well written in concise and easy to understand language. A great book for those new to photography and those wanting to improve their skill set. 30 Practical Tips for Better Photographs is a handy reference to figure out what went wrong with your photograph and how to take advantage of features that are available in your camera. Kevin Gourley explains camera terms in a way that you understand how each feature affects the pictures you take. I recommend this book to anyone looking to improve their photographs. ***** Great teacher and great author! I've taken one of Kevin's photography classes and was excited when he published this book. Everything from the class is in here along with much much more. His photography tips are well-written, technical but understandable, and there are great example photos to go along with the topics. A must have for any photographer who wants to step up their game. ***** The next best thing to taking Kevin's class! The only thing better than this book is taking one of Kevin's workshops or trips, but whether or not you've done that, or can do it, and whether or not you are an experienced or a novice photographer, this book should always be in your camera bag for quick reference. Kevin gives you all the tips you'll need to help you get the photograph you can see in your mind's eye but may have trouble capturing. It's like having Kevin at your shoulder on every shoot, quietly saying "Did you remember to--?" An excellent resource! It's a beautiful book with tons of detailed tips and helpful homework assignments to ensure better understanding of each technique. Love this book and the colorful illustrations throughout. 30 tips to improve your photographs - wonderful concept. The tips are explained well, detailed with example photographs, and offer "homework" to reinforce and practice the concepts. Great resource for anyone wanting to step up thier photography.